What is the Vehicle Big Data Marketplace? 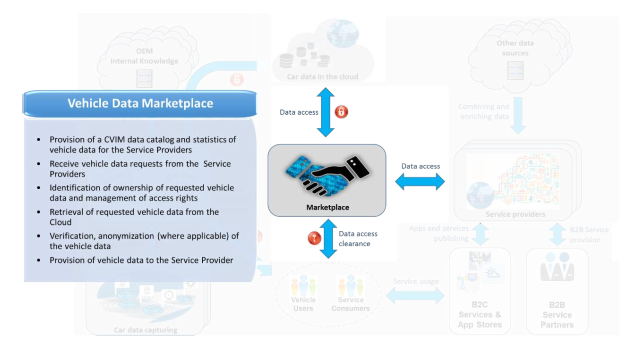 The Vehicle Big Data Marketplace (VBMP) is the central element of the AutoMat Concept representing the mediator platform that offers to cross-sectorial Service Providers (SPs) access to the vehicle brand-independent and harmonized data provided by the Common Vehicle Information Model (CVIM). The vehicle data it’s at the disposal of cross-sectorial industries to discover the untapped business potential of the data to create B2B and B2C services or products. The Marketplace will be open so that any SP, independently of its application domain, can benefit from its potential. The Marketplace will be the central contact point for any SP inquiries related to available types / amounts of data, as well as for the actual data access. The data provided through the Marketplace will be brand-independent and formatted according to the standardized CVIM. The data provided through the Marketplace will take into account the vehicle owner’s desired access rights and privacy aspects. The Marketplace will be complemented by an open Software Developement Kit (SDK) to support the creation of services on the SP’s side. How can Service Providers connect to the Vehicle Big Data Marketplace? AutoMat enables enterprises to explore and discover new business opportunities coming directly from the vehicle data of multiple OEMs. SDK allows accessing to large scale vehicle datasets in a cost-efficient manner through the open platform interfaces that allow us to retrieve the data in a brand independent format according to the harmonized CVIM instead of integrating different data sources with proprietary formatting typologies. 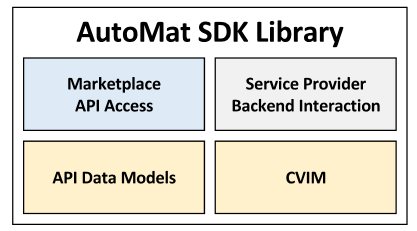 By using the developed SDK/API of AutoMat, it discovers new range of opportunities to third parties (e.g. SMEs and Start-ups) to use the vehicle data as inputs to create new B2B and B2C services or products for cross-sectorial industries. How to facilitate the Marketplace and CVIM usage by Services Providers? We have developed an API library that reduces the technical gap for Service Providers. It allows simple and easy interaction into existing server backends. It supports automated build environments, which help Service Providers to quickly adapt to changes and support continuous integration.